Successfully Added Bluetooth Watch with Vibration and Caller ID Display to your Shopping Cart. 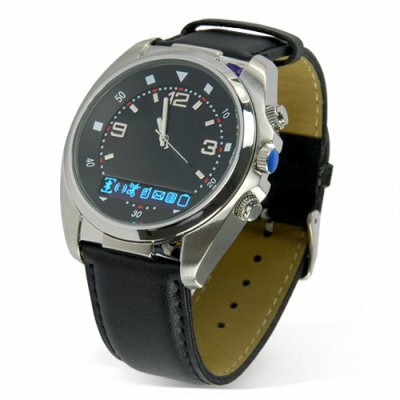 Bluetooth Watch with Vibration and Caller ID Display for winning style and ultimate convenience! Exceptional with fine metal detailing and a comfortable leather strap, this Bluetooth watch is a great complement to your busy lifestyle. Picture this - you are in an important business meeting, but you're also waiting for an important personal call. You can't keep checking your cellphone and you certainly can't let it ring and disturb everyone. Especially not your boss. What do you do? Simply pair this watch to your mobile phone, and this attractive time piece discreetly vibrates when a call comes through. It even displays caller name and caller ID! Then when the call you're waiting for comes through, you can quietly excuse yourself and take it. Or try imagining this scenario. Early morning rush hour. You're on the bus. Your cellphone is in your purse, backpack or briefcase. Your ring tone starts to sound. What do you do? Spend minutes scrambling to fish your cellphone out of your bag? Or maybe this has happened to you. You're watching TV. Your cellphone rings. It's nowhere in sight. You dash around looking for your mobile phone and in the process knock over your bowl of potato chips and glass of grape juice onto your carpet. Why put yourself through this torture? Buy this watch and say bye bye to stress! Give it a try. Buy this Bluetooth Watch with Vibration and Caller ID Display now for yourself, then get 50 more to feature in your online store or re-sell it on eBay to help pay for some more great gadgets you've had your eye on from Chinavasion, the leader in factory direct electronics. Attractive dress watch with comfortable leather strap. Vibrates and displays caller name and caller ID. Great gift for your yourself. Ladies, you can buy it for your husband or boyfriend. What is the benefit of having no brand name on the watch face? For resellers, this brandless watch will not conflict with your own brand. For others, it is preferable not to display a brand name and therefore advertise for the company you purchased the item from. Once I got it linked to my phone, it works fine. It is not overly large on your wrist. This is great for meetings when you still need to know who calls in case of issues at work. The code is 0000 to mate it up to your phone. I could not find that information in the manual.